The fourth edition of BT MindRush was a spectacular success, brainstorming challenges before corporate India, felicitating the best CEOs, and much, much more. All roads led to New Delhi's Taj Mansingh hotel on December 17 for Business Today's annual brainstorming event, MindRush. As usual, a virtual who's who made it a point to be a part of the conclave. What followed was an animated discussion on a host of burning issues before the world of business. The day began with a bang. Reknowned cardiac surgeon Dr. Naresh Trehan, Chairman and Managing Director of Medanta Hospitals, took the stage for the morning lecture at the 'Wakeup Call' session. Trehan asserted that discipline and control over the quantum and frequency of your food intake can make a world of difference to your health, helping you combat deadly diseases like diabetes. "If you have knowledge of your body, you can add ten physically-strong years to your life," he said, adding that 50 per cent diseases prevalant in India are non-communicable. "India is the capital of coronary artery disease, and one-tenth of India's population is either diabetic or prone to diabetes. And diabetes spares no organ," he said. In a stimulating session, Amitabh Kant, CEO of Niti Aayog argued that for India to become a 10-trillion dollar economy and grow at 9-10 per cent, it was imperative for the government to take some bold steps like demonetisation. It'll help the country move towards a cash-less digital economy. According to Kant, economic growth might be hit for two quarters, but India is not a corporate entity that has to just go by quarterly growths. "India is a nation and a nation must have a long-term view... look at where will India be 30 years from now" and the short-term pain is worth the long-term gain. The banks are getting healthier, inflation will slide and tax rates shall go down, according to him. "It will take India to a new normal." And then came the Marquee Keynote address by Jimmy Wales, Wikipedia founder and Internet entrepreneur. Speaking on 'Why Positive Deviance Works', Wales declared that despite the increasing incidence of fake news sites across the world, Wikipedia has not been impacted. The onus of this, he said, is on Wikipedia's community of volunteers who vigilantly write and edit the content. While it has a pool of 80,000 volunteers, the real content comes from 3,000-5,000 people only, who act as Wikipedia's gatekeeper. Contrary to what people think, he said, Wikipedia does not work on the crowdsourcing model. "I hate the word crowdsourcing," he said, adding that the idea of this word comes from outsourcing; finding cheaper labour in another country to get work done at a reduced cost. Reminding the audience about the 'bigger motive' of Wikipedia, he said, "Imagine a world in which every single person on the planet is given free access to the sum of all human knowledge." The platform was global, right from the time it started, and is free to be accessed by all, and free to be distributed and repurposed, he pointed out. In the next session, Professor Deepak Malhotra, Eli Goldston Professor of Business Administration, Harvard Business School, illustrated two essential skills that a negotiator must cultivate -- the ability to create value, which he said was one of the largest leverages one can have and, two, focus on what happens to the other party if there is no deal. He was speaking on 'Negotiating The Impossible'. The professor's speech, replete with interesting anecdotes and stories, also highlighted the importance of the right mindset. "You need one mindset - a learning mindset," he told the packed house. Key to the learning midset is to treat your opponent as a partner. Even those who hurt you. After the lunch break it was the turn of Acharya Balkrishna, MD, Patanjali Ayurved to wield the mike on "The story of a Market Disruptor". Without the trappings of a business magnet or a management guru, Balkrishna was able to convincingly explain the thinking behind Patanjali. "Our business mantra is: solve the problems of people, and they will reward you with success," said Balkrishna. In a panel discussion that followed, four Dalal Street veterans gave their wisdom on "How to survive stock market in 2017". The advise: stay invested for the long-term. Ridham Desai, Managing Director, Morgan Stanley India, said that the markets are in the midst of an earnings recovery. "That story would have built up nicely in the next two quarters but because of demonetisation it has been pushed back," says Desai. Agreed Nilesh Shah, MD, Kotak Mahindra Asset Management Company: "We are looking at three to six months of delayed recovery." Rashesh Shah, Chairman and CEO of Edelweiss Group believes that the move was just not an economic experiment but a social experiment. "It's an experiment that has a lot of benefits with an increased flow of informal funds into the formal system," he says. Bharat Shah, Executive Director, ASK Group, pointed out that there could be a shift from physical assets to financial assets because of demonetisation. Indeed, the issue of demonetisation, which has grabbed headlines over the last one month, was the topic of an exciting discussion, with top economists presenting diverse points of view. Arvind Virmani, Chairman, Policy Foundation, said the timing of the move was not the most conducive considering the volatility in the global economic scenario and rabi crop sowing. The loudest round of applause was reserved for Subhashish Gangopadhyay, Managing Trustee at IDF, who stressed on the need for more equitable laws to remove the possibility of corporates benefitting from special provisions. Economist Arun Kumar said there is already an impact on the unorganised sector which will next impair the organised sector but Rajiv Kumar, Senior Fellow, Centre for Policy Research saw any impact of demonetisation on growth as just a transitory phase. The evening was reserved for the Best CEO awards. In his welcome address, Prosenjit Datta, Editor Business Today said that the winners had consistently outperformed over the past three years. "Disruption is the new normal in business but many see it as an opportunity not merely as a threat," he said. Speaking on "Disruption and the Future of the Automobile Industry, Venu Srinivasan the Chairman and Managing Director of India's third largest two wheeler company, TVS Motors, said that disruption in the automotive industry over the next decade will outpace the developments of the past century ruled by internal combustion engines. C. P. Gurnani, CEO & MD of Tech Mahindra said that the workplace of tomorrow can be anywhere in the world. "Workplace of tomorrow will be distributed. Technology will continuously change, and workplace will evolve. Technology will keep creating new productivity tools. But we will still require human intervention. I don't visualize a workplace with no manual intervention," he said. Deepak Kapoor, Chairman of PwC India, who partnered BT on the Best CEO study, pointed out that while "CEOs are confident about the future they realise they have to be transform and stay relevant to the marketplace". In his vote of thanks, Aroon Purie, Chairman and Editor-in-Chief of the India Today Group, explained why "Positive Deviance" was being debated at MindRush this year. "We have seen businesses increasingly depend on people with ideas that are outlandish enough to succeed against all odds," he pointed out. Indeed, positive deviance is "wisdom that has to be found from within the community, industry, business or even organisation", he said. Electronics & IT Minister, Ravi Shankar Prasad, who also heads the Law & Justice ministries, was the Chief Guest at BT MindRush 2016, where he also gave away the prestigious Best CEO awards. In his address, the minister said, the government is setting the agenda for transformative reforms - this includes programmes such as 'Digital India', 'Make in India', 'Skilling India', 'Start-up India', 'Stand Up India', among others. "Narendra Modi has not become PM for the sake of cutting ribbons. He has got this massive mandate to transform India," he emphasised. The curtain came down on the show with the winners being felicitated. Venu Srinivasan was the Champion of Champions while Nishi Vasudeva was the Best CEO (Super Large Companies). 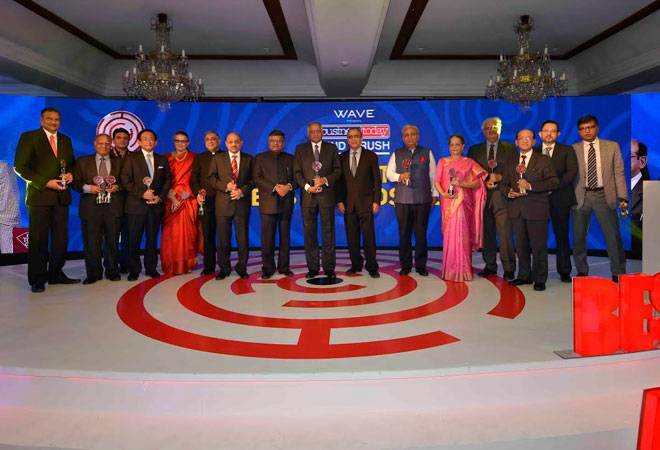 Other category winners included Sunil Mittal, Sunil Duggal, among others.